Ryan Andresen with his father Eric Andresen, 52. 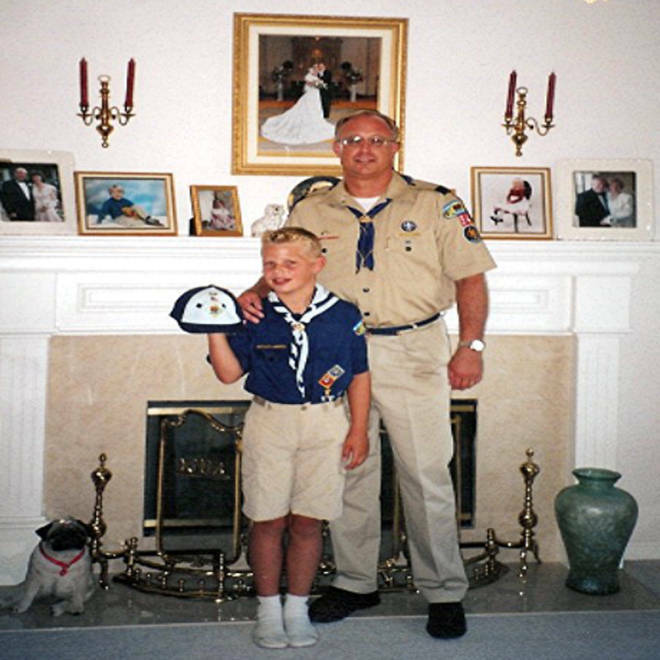 Ryan Andresen had completed the requirements to earn his Eagle Scout award, but his his father, Eric, said the Scoutmaster told him his son wouldn't get it because he recently came out as gay. The Boy Scouts of America said Andresen was no longer eligible for membership in Scouting because of his sexual orientation and since he does not agree to the BSA's principle of "Duty to God." Updated at 10:00 p.m. ET, Tuesday -- Matthew Kimball walked away from the Boy Scouts in 2005. Since he was gay, Kimball knew that his sexual orientation would be at odds with the Boy Scouts of America’s policy banning gay Scouts and leaders. Kimball was both: an Eagle Scout and an assistant Scoutmaster. Kimball had not revealed his sexual orientation during his Scouting years. But he decided, like a number of other gay Scouts, that he could no longer stay publicly quiet about the organization’s membership policy after learning that Ryan Andresen, a teen from his own Troop 212 in Moraga, Calif., had been denied the Eagle rank last week because he is gay. “My immediate reaction was frustration with myself, because I felt if I had done what this kid did … he wouldn’t have to be going through this, hopefully,” said Kimball, referring to Andresen’s coming out in July to his troop in a letter. The Eagle portrait of Matthew Kimball when he was 17 years old. Another version of It hangs in the Troop 212 hut in Moraga, Calif. Kimball left the Boy Scouts in 2005 without revealing that he is gay. He stepped forward, like a number of other gay Eagle Scouts, to back Ryan Andresen's bid to earn the Boy Scouts highest rank. Andresen was denied the Eagle award because he is gay. Andresen, 18, had completed the requirements to earn the Scouts’ highest honor, but his Scoutmaster would not sign off on the award because he is gay, his mother said. The Scoutmaster has not replied to emails or a phone call seeking comment. Kimball, a technology entrepreneur in San Francisco, said he has received up to 170 pledges of pins from Eagle Scouts, including about 48 from Troop 212 alumni. Scouts for Equality said last week that some 300 Eagle Scouts had returned their regalia in protest to the Boy Scouts since the organization announced in July that it had re-affirmed its membership policy after a confidential, two-year review. But many other Eagle Scouts have said they agreed with the policy. A spokesman for the Boy Scouts of America, Deron Smith, said 50,000 Scouts earn the Eagle rank every year, and in August noted that a “few” had returned their medals, badges or certificates since the membership policy announcement. On Tuesday, he said he didn’t have an update on numbers of regalia returned, but noted such items were either kept at the national office or stored in the National Scouting Museum. He also said Scouting ranks, such as the Eagle Scout, represent a past achievement and the BSA did not revoke them once they were awarded. Most of the Scouts pledging their pins were heterosexual, Kimball said, though a number of gay Eagle Scouts made similar offers in emails sent to NBC News since hearing of Andresen’s story. One of those was Eric-Richard de Lora, an adviser to the Gay-Lesbian Union that Andresen and others founded at his high school in Berkeley, Calif., this fall. De Lora, 53, said he considered returning his Eagle in 1997 after coming out but felt strongly that he had earned it and decided to keep it. He also thought about returning it in 2000, when the U.S. Supreme Court sided with the Boy Scouts on the anti-gay membership policy. “Ultimately I held on to the award believing that it might someday serve a useful purpose,” said de Lora, a teacher at Maybeck High School. 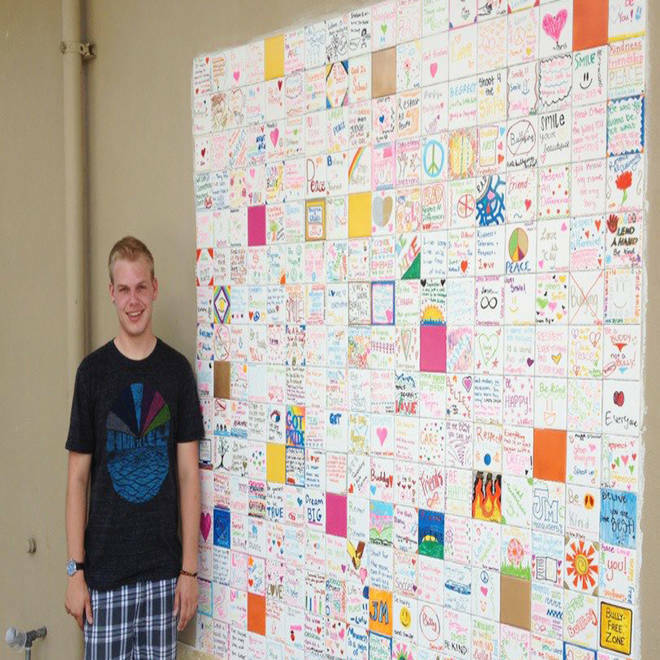 Ryan Andresen stands in front of a "tolerance wall," his final Boy Scouts' project that he worked on with school children at his former middle school. It consists of 288 tiles that depict acts of kindness. That day appeared to come after Andresen informed de Lora last Monday about what was happening with his Eagle bid. Andresen, de Lora wrote, had completed the requirements for the Eagle, including building a “tolerance wall” for victims of bullying such as himself. Another gay Eagle Scout, Robert Goris-Kolb, a 25-year-old pharmacist from Grand Island, N.Y., said his husband had been pushing him to return his badge after the BSA announced it was sticking with the membership policy. Karen Andresen, who had started an online petition calling for her son to get his Eagle rank, said the Scoutmaster knew about her son's sexual orientation and that Ryan was led to believe he would nonetheless get the award. 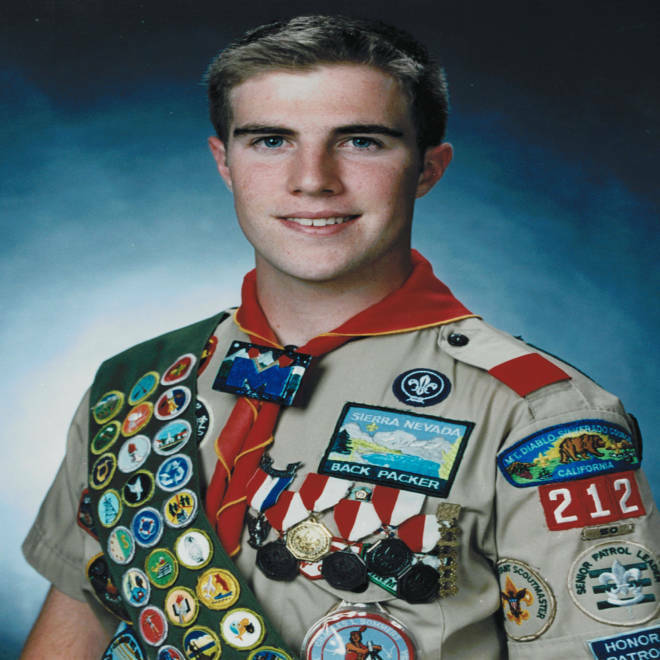 But Boys Scouts spokesman Smith said Andresen was no longer eligible for membership in Scouting because he did not meet the membership standard on sexual orientation and he had informed his unit leadership that he did not agree to Scouting’s principle of "Duty to God." The family disputed that, saying the only reason Andresen was denied the rank was "because the Boy Scouts of America has a problem with Ryan being gay." Kimball, who knows Andresen’s father, Eric, the troop's chief administrator, attended a troop meeting earlier this week on how to resolve Ryan’s case. He said talks were under way on recognizing the teen’s accomplishment while keeping the troop together amid the difficult time and some hard feelings.